Offered by US based London Connection. 1 Bedroom 1 Bath. Cambridge Circus for those traveling to London for theater, clubs, and restaurants, this is the center of the world. A stroll from Cambridge Circus down Shaftesbury Avenue to Piccadilly Circus is one of the most exciting walks in London; you will pass ten theaters with some of London's most exciting plays and musicals. Trafalgar Square is a five-minute walk, and the Houses of Parliament and Westminster Abbey are an easy walk. The National Gallery and St. Martin-in-the-Fields are close by and will offer exhibitions and concerts unequalled in London. Six out of every ten visitors choose to stay in this district of the city. The Palace Theater is also on Cambridge Circus. 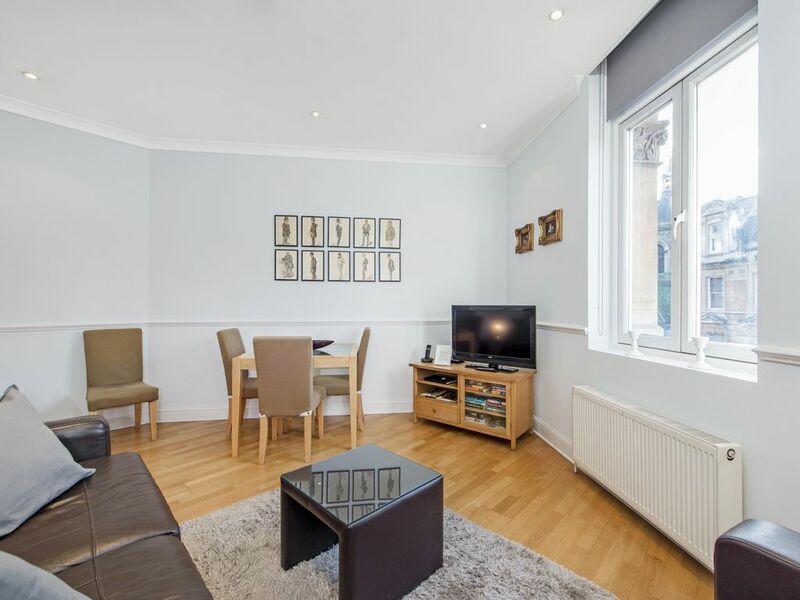 The one bedroom apartment has just been redone to a very comfortable standard. Because the apartment is located in a very active part of London, the windows have been covered with double glazing so the flat is quiet and comfortable. The LIVING ROOM has comfortable furnishings with a SOFA BED which can be used by an additional visitor if occasionally required. There is excellent lighting and a flat screen TV. The BEDROOM has a UK Super King size bed which can be changed into two singles and good storage. The BATHROOM has a shower over the tub, wash hand basin, and loo. The KITCHEN has all machines including washer/dryer, dishwasher, oven and hob, and fridge/freezer. This is an excellent accommodation and perfect for visiting London when considering location, budget, and standard. For two persons (third person on a sofa bed) it is perfect. The flat is on the 3rd floor with a LIFT to the apartment. Very, very nice accommodation. High speed wireless internet is included. Property is designated non-smoking. If you are traveling in a LARGE GROUP, there is another 1 bedroom flat, a two bedroom flat, and a 3 bedroom flat in this same building. So up to 14 people traveling together can stay in the same building, and that is a wonderful possibility for families traveling together. Really felt at the heart of it all. We could walk to nearly all the places we wanted to. The tube was very easy too. Avoid rush hours. (use your contactless credit/debit card at ticket points). The entrance to the apartment is unfortunately surrounded by dustbins and the communal areas are tatty, but once inside the apt it is immaculate.. very adequate for two and SO much better and cheaper that a hotel. There are many eateries and takeaway food shops right on the doorstep. Bed was comfy. Shower was OK, but jacuzzi bath takes ages to fill and goes very narrow in the middle so you keep banging your elbows on the side handles. Noise did not disturb us at all. Two things that nearly made me cancel the booking was that I had to sign a lease and the owner asked me for my card details. I thought it was all a scam. All very odd!! But it's an American company and I presume that must be how they do things over there. Also I had to pay an extra £20/30 'let in' fee! The wording sounded as if this was optional and you could be given a key code on an app, but it's not. It should be included in the rental. The guy who let us in was very good however. We would stay again now that we know for sure that it is all 'above board'. It is SO convenient. Thank you for your review. We're glad that you enjoyed the comfort of this property and the convenient location to shops and restaurants. In regards to the entrance, this property is located next to a restaurant and we try to encourage them to keep the area tidy. Fabulous location in the theatre district close to public transport, restaurants and all that's fantastic about visiting London. We highly recommend the host's driver who collected us at Heathrow Airport and transported us to the flat where we were met on arrival by Gus who explained everything to us. The milk in the fridge was an added bonus! Thank you for a memorable holiday. Thank you very much for your review. We are happy to hear that you enjoyed the great location of the property and were pleased with the service you received from our staff. This is a great apartment located in the theater district. Super close to everything! Very clean and as described. We were met at the door by Gus who did a fantastic job getting us settled. You will not be disappointed in staying here. Thank you very much for your review! We are happy to hear that you enjoyed the convenient location and comfort of the property, as well as the service you received. This is the second time we have stayed here, so it’s obvious that we love the flat. This time we had a heat- wave, which required us to have the windows open, and the street noise was loud. Also, one of the double pane windows did not shut properly. However, the location is terrific and I would highly recommend this flat, especially if you love the theatre. We knew this was a good location but didn't realise just how great it was. Located right in the middle of London Soho surrounded by the best theatres and so many Restaurants to chose from the unit was a perfect spot for our week in London. It was close to public transport, both Bus and Tube, but well within walking distance of the major London landmarks if you like a walk. Leicester Square with all its attractions was around 3 mins walk away and just 3 mins more to Covent Garden. We used the hosts driver for a seamless trip from Heathrow to the Flat and we were met by our host on arrival. He was more than helpful and took the time to explain everything to us. Thanks to our Hosts who were great to deal with, we loved the unit and had a memorable stay. Thank you very much for your comments. We are glad to hear that you had a memorable stay in London and were pleased with the location of the property and the service you received from our staff. This apartment was perfect for our 5 night stay in London. I stayed with my mum on her first London trip and the location was amazing. It is close enough to most attractions to be able to get there by foot and a couple of minutes walk to the underground for those a little further away.We had tickets for The Mousetrap which turned out to be literally seconds down the street! The apartment itself was just as the pictures showed, and apart from the lift being out of order for the first few days (meaning a long walk up to the 4th floor) it suited our needs well. The bed converts into 2 singles which meant we didn't need to use the sofa bed, and they were very comfortable. The area of Cambridge Circus is busy and noisy but we found we adjusted to it after the first night and by using the fan to provide white noise. I would happily stay here again, the location is amazing, the view down to Cambridge Circus is great and the apartment itself is perfect for 2. Thank you very much for your response. We're happy to hear that you enjoyed the location of the apartment and the close proximity to theaters and the underground. We apologize for the lift being out of order for a time during your stay, but are glad you found the property to be comfortable. We do hope you will return to stay with us again in the future!